Many have successfully purchased a home theatre system that produces multi-channel audio to enhance the video experience. When it comes to playing two channel stereo most of these systems are inadequate. One solution to this problem was to spend a huge additional sum of money so the music lover can enjoy two-channel stereo audio. This problem is solved by the introduction of the new great value high performance Soloist range. The Soloist 3 and 5 amplifiers have a multi-purpose design: to integrate with multi-channel audio systems to produce high quality two-channel stereo audio performance. Alternatively to be used strictly as a two-channel stereo only, with superb results. Its compact size offers versatility but without compromising performance. The Soloist Series easily outperforms more expensive audio components. 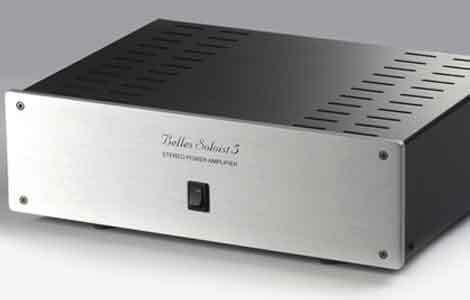 The Soloist range consists of the Soloist 3 high performance stereo preamplifier and the Soloist 5 high performance stereo power amplifier.